Ceiling fan Buik, optional lighting, with reversible wooden blades in white and beech. Chain-driven, optional control, reverse function available to allow you to maintain a proper temperature in summer or winter. Can be installed on sloping ceilings up to 17 degrees.>br />Dimensions: Heigth 36 - 46 cm. Diameter 132 cm. 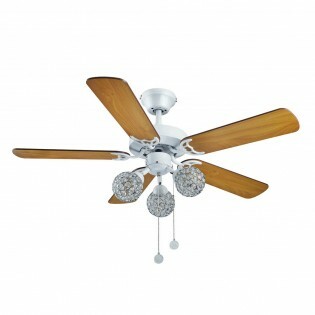 Ceiling fan(optional lighting) to be installed as a flush light. Reversible blades with grey and pine finish. It includes a remote control with which to regulate the speed and inverse function to regulate the temperature in any season. Suitable for ceilings with an inclination of 17 degrees. Total dimensions: Heigth 29 - 42 cm. Diameter 122 cm. Ceiling fan Crossb with seat post to adjust the height from 29 to 42 cm. Three speed operation via remote control (included), includes timer function. Its MDF blades are reversible, in white and walnut finish. Possibility of including lighting (two light points).Dimensions: Height 29 - 42 cm. Diameter 122 cm. 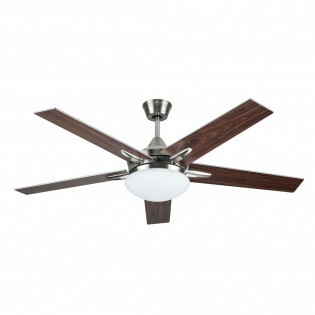 Ceiling fan Denel (can be placed with lighting) with metal frame, glass and reversible nickel and walnut wood blades. You will be able to activate it comfortably by remote control, with an inverse function that will allow you to optimize the temperature of the space in any season. Dimensions: Heigth 34 - 47 cm. Diameter 132 cm. 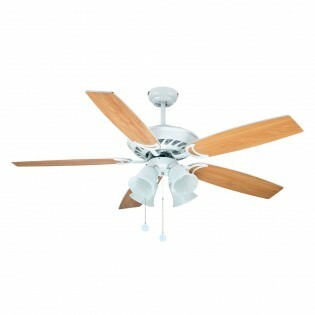 Ceiling fan with LED lighting of 18 W, warm temperature. Remote control to turn it on and set parameters such as speed (six positions available) or its inverse function, to achieve the perfect temperature in any season. Suitable for sloping ceilings up to 23º.Total dimensions: Heigth 36 cm. Diameter 112 cm.Blades dimensions: Length 53.4 cm. 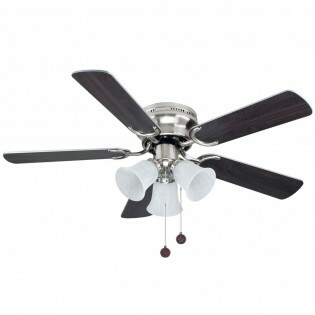 Ceiling fan Hornethat can be installed as a flush light and chains for operation (optional control). Three lighting points can be connected. Two models available, four reversible blades in white and multicolour or grey and beech. Ideal for bedrooms or dining rooms.Dimensions: Heigth 36 - 43 cm. Diameter 105 cm. 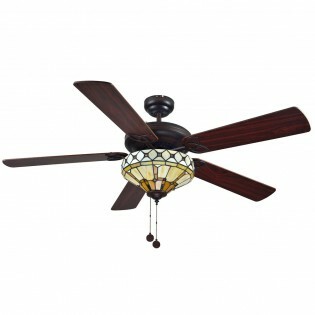 Ceiling fan rustic style with metal and glass body and four natural wood blades. It includes a remote control with timer function and three-position speed regulation. Suitable for sloping ceilings. You can place it as a ceiling light. Dimensions: Heigth 35 - 48 cm. Diameter 122 cm. 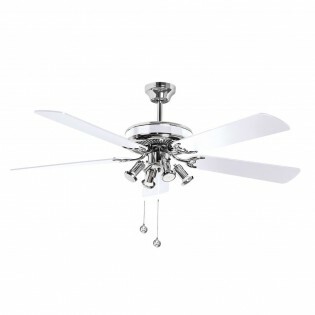 Ceiling fan Corvete with LED lightingof 18 W integrated. Lighting angle of 180º, warm color temperature. 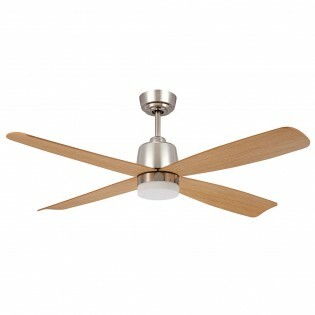 Metal main part and beech wood blades, ideal for modern rooms. Includes a remote control to set the speed and activate its inverse function. Dimensions: Heigth 38 cm. Diameter 132 cm. 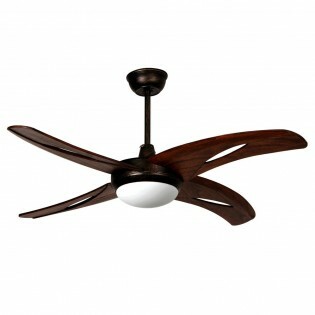 Ceiling fan with LED lighting of 18 W integrated, warm colour temperature. It operates at six configurable speeds via remote control. You can activate its inverse function, which will regulate the temperature of the space in any season of the year. Suitable for sloping ceilings up to 23 degrees.Dimensions: Heigth 38 cm. Diameter 142 cm. 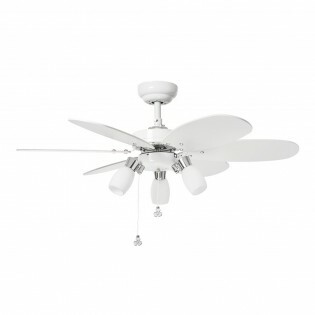 Ceiling fan with LED lighting, 120º lighting angle. Remote control included, to activate its different functions, including timer. It has three blades made of natural wood, ideal for rustic rooms. 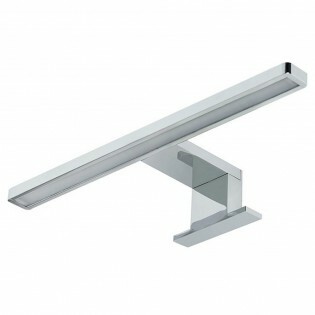 Can be installed as a flush light, on sloping roofs up to 25 degrees.Dimensions: Heigth 51.2 - 63.9 cm. Diameter 132 cm.Blades dimensions: Length 64.1 cm. 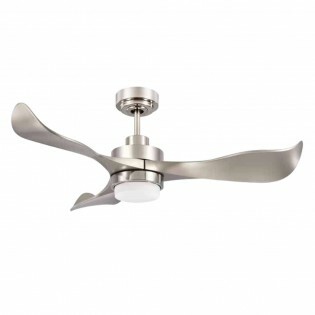 Ceiling fan, LED lighting integrated with 100º of opening angle. Neutral colour temperature ideal for kitchens, bedrooms... Includes remote control. You can set the speed in three positions and activate its inverse function, to achieve an optimal temperature in any season. Dimensions: Heigth 32 cm. Diameter 142 cm. Ceiling fan Plywood, optional lighting. Reversible wooden blades in grey nickel and walnut. With the remote control (included) you can set its speed (three positions) and activate its inverse function, optimizing the temperature in any season of the year. It can be installed as a flush light. br />Dimensions: Heigth 32 - 45 cm. Diameter 132 cm. Ceiling lamp Circles with three lighting points, to use as the main light in your dining room, living room or bedroom. The main structure is made of chrome-plated metal and the lampshades are covered by circular wire structures. Adjustable height to adapt it to the dimensions of your space. Dimensions: Height 48 - 68 cm. Width 46 cm. Ceiling lamp Ebro with a beautiful finish lampshade made up of floral decorations in different colours: blue, white, orange...Complete manufacture in tiffany glass. 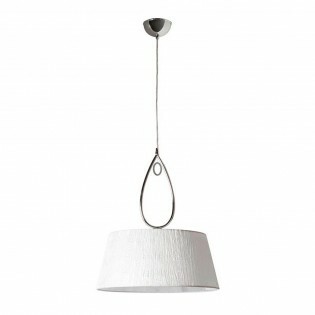 You can easily manipulate the hanging chain to adjust the height of the lamp. Ideal for the dining room or bedroom. Dimensions: Height 45-110 cm. Diameter 40 cm. Ceiling lamp with industrial style design. Ideal for lighting bars or restaurants with an industrial touch. Made of metal with three lighting points located at different heights, by adjusting its position you will get different types of lighting. Lighting angle: 180 degrees.Total dimensions: Heigth 130 cm Width 36 cm.Lampshade dimensions: Diameter 20 cm. Ceiling lamp from the Karloff collection. In-line lighting points made of glass and metal main structure with black finish. It will provide complete lighting to your living room, dining room or bedroom. Ideal for vintage style rooms. Total dimensions: Height 96 cm. Width 150 cm.Lampshade dimensions: Diameter 20 cm. Ceiling lamp Orbit You will love it for its elegant, modern and sophisticated design. Metallic structure and crystals throughout the lampshade. You will get a lovely light effect. Ideal to place in the main rooms of the house: bedroom, dining room, living room...Dimensions: Heigth 50 - 120 cm. Diameter 40 cm. Ceiling lamp with chain pendant, easily adjustable to adapt the height of the lamp to your dining room, kitchen, bedroom... Its tiffany glass lampshade will delight you giving any type of decoration a unique and different style. Different colours: yellow, blue, green....make a beautifully finished mosaic. Dimensions: Height 45-110 cm. Diameter 40 cm. Ceiling light Carol modern style. The acrylic lampshade is available in three colours: transparent, white and black. In addition, it has a chromed fleuron and transparent cable. Its sphere design with vertical openings is excellent for decorating living rooms, dining rooms, bedrooms, youth bedrooms or corridors. Dimensions: Height 45-160 cm. Diameter 30 cm. Hale LED Ceiling Light, with a hoop-shaped design illuminated with LED technology. Adjustable in height so that you can hang it at the height you need. 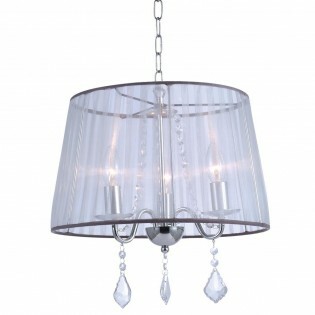 This pendant lamp is excellent for illuminating large areas, such as dining rooms, living rooms or offices. Dimensions: - Small: Height 11-120 cm. Diameter 45 cm. - Large: Height 11-120 cm. Diameter 60 cm.